I love those moments when I am dog sitting that make me smile! 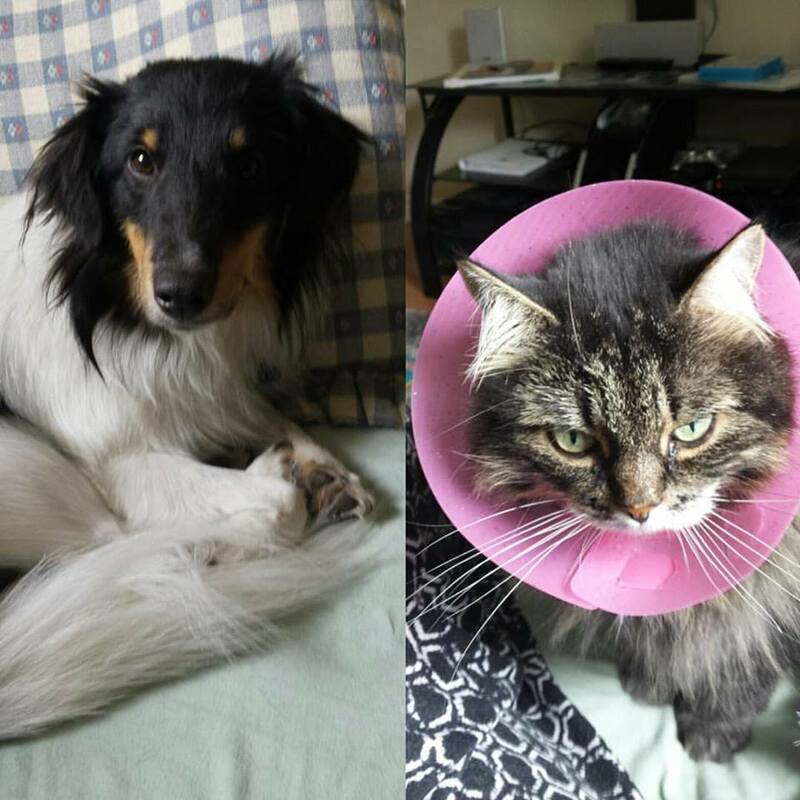 My Grand Puppy and Grand kitty are here for the week visiting while their parents are away, that makes two felines and two canines…team Waterloo versus team Belleville? 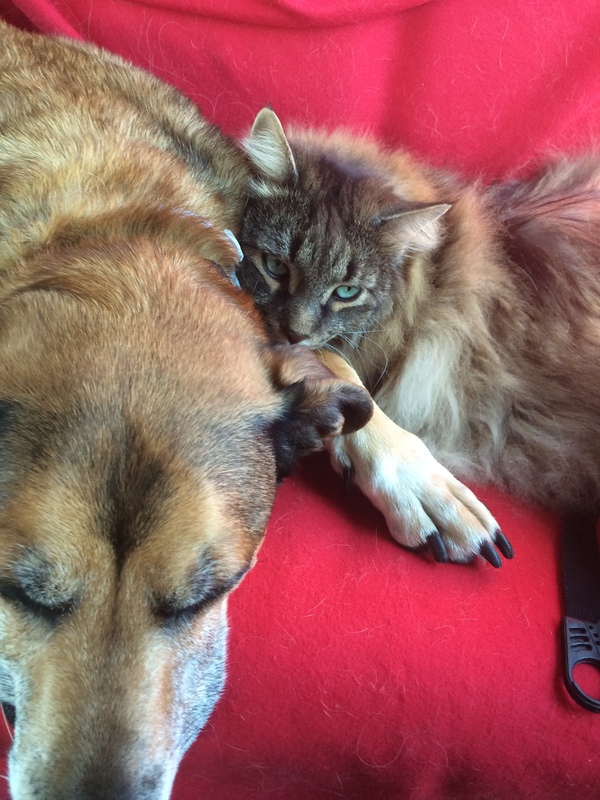 Or perhaps the dogs would band together and the cats would be partners in crime? Lucas for the most part likes to sleep, this morning I found him parked in the middle of the living room after his morning stroll, head bobbing as he was trying to maintain consciousness, he could care less what everyone else was up to. Romeo came into the kitchen looking for a snack, he was famished after a night of trying to get to his food bowl without being thwarted by Savannah, as she pushes him out of the way and eats every morsel in his dish, leaving him nothing. I poured a couple tablespoons on his saucer and stood by the door, to supervise, now that I was awake it was my duty to be his security detail and keep off all the lurkers who doubt his abilities to eat his own meal. As Savannah slunk into the kitchen, trying to look like she wasn’t on a mission to perform her magic trick “now you see kibble, no you don’t”, Rupert, her house mate, briskly walked up and blocked her. That saucy little puppy that nips that back of my calves, because I apparently look like a sheep, was not going to allow that cat to steal one more plate of food! He stood between the two cats making sure that Romeo had a chance to eat every last bite! I have been pondering this morning, did he stave off Savvy’s thieving intentions out of altruism, trying to help out his host or was it simply, “if I am not allowed to eat these tiny bite sized morsels, by gum that bossy feline that swipes at me with her claws and hisses at me, she is definitely not going to!” Whatever the case may be, watching the scenario, made me smile!